We've seen two Final Fantasy XIII summons: the Odin summons from heroine Lighting (pictured) and Shiva from bandana dude Snow. The lady motorcycle summons, aka Shiva, is all kinds of unique. It goes so far over the cliff that it bounces right back into awesometown. Lighting's Odin summons? Less so. 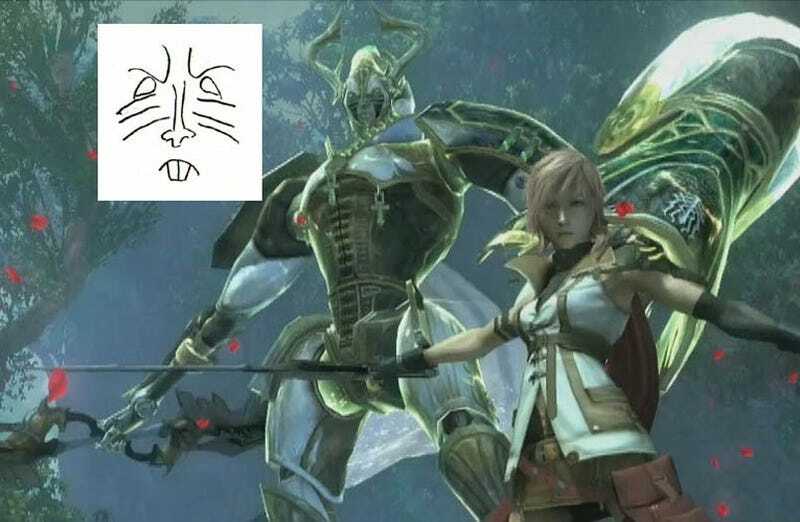 The Japanese internet has been critical of it — calling the summons beast things like "rat face". At E3, we thought let's show off the cool summons, and with overwhelming nervousness, we kind of blundered with both Odin and Shiva... Because of that, we're not showing the whole thing! Until we have another chance, we hope to keep perfecting them, so please wait only a little bit more. More awesometown please, less rat face!